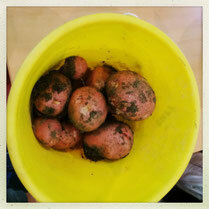 Thank you to all the children who helped us plant the potatoes earlier this year. We got a bucket full last week! Our garden is great for getting little fingers interested in plants, seeds, and growing things. We are very proud of all the herbs and veg we get to grow with the children.